An economy needs a quantity of money commensurate with the amount of business being transacted—too little causes depressions and too much causes speculations followed by depressions. Furthermore, as noted by Benjamin Franklin, much of the gold and silver in the American colonies was being exported to Europe to pay for imported goods, leaving little for the American colonies to conduct their own business. As Franklin also noted, an economy needs the right amount of currency to conduct its transactions, no more nor less; otherwise, there will be unemployment, deflation, and a contraction of the economy. As an economy expands, it needs more money, but silver and gold could not be increased just when the economy demanded it—hence, another solution was needed. The solution, provided by banks, was to take deposits of silver and gold and issue banknotes that could be redeemed for silver or gold on demand. Banknotes were a record of deposit. If you deposited gold or silver, the bank would issue you the equivalent amount of notes, so these notes were, in effect, your "passbook" of savings. If you wanted to pay someone, it would be with the banknotes. The receiver of these notes could pay someone else with the same notes, or redeem the notes at the bank for its gold or silver. So, in this sense, they were also like a bank check. Banks also lent money in the form of banknotes, earning interest on the debt while it was outstanding. Because most people did not redeem their banknotes for specie at one time, unless there was a bank run, banks could issue more banknotes than they could back with specie, thus creating money for the economy in the form of loans. The bank's banknote liability decreased as loans were repaid, either with its own banknotes or with specie. Thus, a bank's ability to lend depends on the amount of specie that it held in its vaults compared to the amount of redemptions during the course of business. A bank must always be able to redeem its notes in specie, for if it fails to do so, then people will lose confidence in the notes of the issuing bank, causing a run on that bank, where all the bank's noteholders rush to redeem their notes in specie, before the bank runs out. The 1st banks were established in the early 1780s — the Bank of North America, the Massachusetts Bank, and the Bank of New York — created primarily to issue banknotes as a means of promoting business, accept deposits, and made loans. Until the Wildcat Banking era that began in 1837, investors, mostly wealthy, who were interested in opening a state bank, could only obtain a charter by a special act of the state legislature, and often, the granting of these charters was based more on political connections than on the ability to manage a bank. These charters were eagerly sought, since it was literally a license to print money. There were no minimum reserve requirements, so banks could issue as many notes or extend as many loans as the public was willing to accept; this willingness was based on a bank's history of exchanging their notes for specie. During the war of 1812, coins became scarce, making it difficult for the banks to redeem their notes for specie, so many did not. In fact, they issued more banknotes, causing inflation. The First Bank of the United States was based on a 20-year charter that was allowed to lapse in 1811, partly because 80 state-chartered banks opposed the federal bank, because most Americans preferred the federal banknotes over the state banknotes, and also because the federal bank accumulated many state banknotes and presented them to the state banks for redemption, which caused financial stress for many state banks when they had to redeem so many of their banknotes at once. Print of a bank note for $25 with a bust portrait of George Washington in a medallion surrounded by text which states: "The President, Directors and Company of Washington Bank in Westerly [Rhode Island] promise to pay to [blank] or Bearer on demand. Twenty Five Dollars. Westerly [blank] 18 [blank]. With space to be signed by the "Cashr." and "Presidt." Without regulation, state banks started issuing more banknotes than they had specie to redeem them with. These banknotes help to fuel the boom after 1815. With readily available credit, farmers borrowed money to buy more land and plant more crops, but bumper crops in Europe and a business recession in Britain reduced foreign demand for United States wheat, flour, and cotton. Consequently, both farmers and land speculators were unable to repay their debt, causing the price of land to drop significantly, which caused many banks to fail during the panic of 1819. Because of the importance of banks and money to an economy, a bank could not be formed by just anyone. They required a bank charter from the state to legally exist, and, although not just anyone could start a bank, anyone with the right political connections could, whether they knew how to manage a bank or not. Before 1837, a state bank charter could only be obtained by the approval of the state's legislature; federal charters were not available until 1863. And because banks could print money in the form of banknotes, naturally, many people wanted to start banks. This fostered corruption and favoritism. So that bank charters were not just granted to political cronies, Michigan, in 1837, began the trend of free banking where a bank charter could be obtained without an act of the legislature; only very minimal requirements had to be satisfied. Other states followed, with New York enacting a free banking law in 1838, but required that banknotes be backed by government bonds. Presumably, this would protect depositors and noteholders, since if the bank failed, then the collateral could be sold to satisfy the bank's customers. The Suffolk Bank in Boston Massachusetts began a new practice of redeeming banknotes of other banks, but only if the banks had enough deposits with the Suffolk Bank to cover the redemptions. Because Boston was a major trade center, many banks in New England began to accept this new system, referred to as the Suffolk banking system, which encompassed virtually all New England banks by 1825. New York also developed a safety fund system, in the early 1800s, requiring member banks to contribute a small percentage of its capital annually to a state managed fund that could be used to reimburse noteholders when a bank failed. This was probably the earliest form of deposit insurance. Another law to protect noteholders was an early form of a reserve requirement, enacted by Louisiana in 1842, limiting the number of banks and requiring them to maintain at least 1/3 of their assets in cash and 2/3 as short-term obligations. Other states also enacted free banking laws, but there was little regulation, so many banks failed. Indeed, many of them actively conducted fraud. With little oversight of the banks, restrictions were not effective. Instead, banks proliferated and printed more banknotes than what they had in specie. In fact, some banks—referred to as wildcat banks—deliberately located in the remote wilderness expressly to make it difficult for any of its banknote holders to redeem their notes for specie. The free banking years, from 1837 to 1863, became known as the Wildcat Banking era. Unfortunately for merchants, this proliferation of banks created a proliferation of banknotes. The value of banknotes depended on the distance from the issuing bank, both because the banknote holder had to travel to the bank to redeem them in specie and because people were less familiar or unfamiliar with distant banks, and, hence, would not accept the banknotes as payment, at least not at full face value. It was, thus, difficult to know the value of a particular banknote, and it was difficult to distinguish counterfeit notes from real banknotes. To solve this problem, registers of banknotes were published periodically and distributed to merchants so that they could look up the value of a particular banknote. This was an inefficient process at best, and it created an appeal for a national uniform currency. 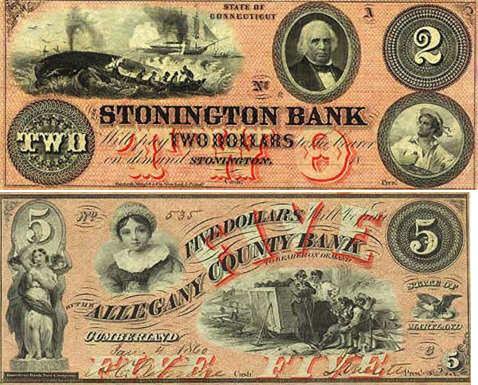 $2 private bank note issued by Stonington Bank, Connecticut and $5 private bank note issued by Allegany County Bank, Maryland. Established national banks based on a federal charter, thereby creating the dual banking system with national and state chartered banks. Established the Office of the Comptroller of the Currency (OCC). One of the OCC's duties is to assess the soundness of national banks through bank examinations. The standards required for a federal charter were generally stricter than for state charters. Increased the annual federal excise tax on state banknotes from 2% to 10% to eliminate banknotes issued by state banks. The banks were required to pay this tax based on the nominal value of their issued banknotes—hence, state banknotes were mostly replaced with federal notes. However, the state banks circumvented this tax by creating checks, which are like banknotes except that the payer and payee are designated. With checks, the banks could lend more money than they actually had, just as they had done with banknotes. This was the start of the dual banking system that exists today, where a bank can operate under a state or a federal charter. National banks were allowed to issue a federal banknote that had the same value everywhere in the country and that was backed by government bonds. To improve their safety, national banks had to hold at least 1/3 of their capital in government bonds. To issue banknotes, the national banks had to deposit $100 worth of federal government bonds with the Comptroller of the Currency for every $90 of banknotes issued. If the bank failed, the bonds would be sold to reimburse banknote holders; however, it did not cover depositors. The federal government wanted state banks to become national banks; however, most banks resisted because of the restrictions of a federally chartered bank. The imposition of a 10% annual excise tax on state banknotes caused many state banks to adopt a federal charter, but many others still refused; instead, they stopped issuing banknotes and starting using demand deposit accounts—checking accounts—that gave depositors another form of payment. By the 1870's, checking accounts and the lax restrictions of state governments fueled the growth of state banks, since they had lower reserve and capital requirements, could make more types of loans, and had fewer restrictions on bank branches. Demand Treasury note printed in 1861. These notes were the 1st paper currency printed by the United States government that were issued for the express purpose of serving as fiat money. National banknote, Winters National Bank of Dayton, Ohio, printed in 1901. To assure the holders of this note of its safety, the text in the top middle of this note states "This note is secured by bonds of the United States. Deposited with the U.S. Treasurer at Washington." 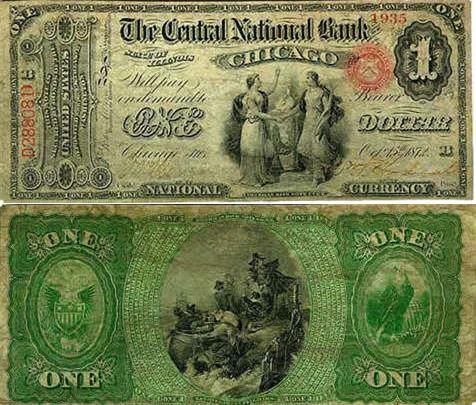 Front and back of a $1 National Bank Note issued by Central National Bank, Illinois, 1872. 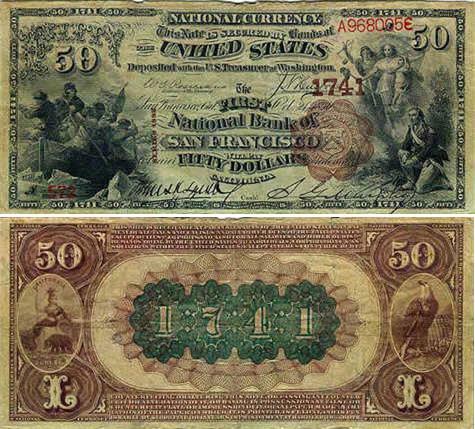 Front and back of a $50 National Bank Note issued by First National Bank of San Francisco, 1890. One concept that was evolving during this time was the idea of correspondent banking. A bank could obtain the services of another bank by keeping a demand deposit account with the other bank—the correspondent bank. Demand deposits could not legally earn interest, but the correspondent bank would offer services in lieu of interest for the deposits. One of the 1st banks to begin offering correspondent bank services was the Suffolk Bank in Boston which would accept the banknotes of another bank if the bank held enough deposits in the Suffolk Bank to cover them. Because Boston was a major trading center, other banks felt obliged to keep deposits there to be competitive, since banknotes that were accepted in Boston would be more valuable, especially for banks outside of Boston. The National Banking System had reserve requirements that could be distributed to correspondent banks. For this, national banks were divided into 3 classes: central reserve city banks, which were the largest banks located in the largest cities, initially New York, Chicago, and St. Louis; reserve city banks, which were originally located in 16 smaller cities but was later expanded to 49; and country banks, which categorized all national banks that were located elsewhere. The country banks were required to keep at least 15% of their deposits as reserve requirements: 6% had to be kept in their own vaults, and the remaining 9% could be kept at reserve city bank. Both the central reserve city banks and the reserve city banks had a 25% reserve requirement. The reserve city banks had to keep only half of their reserve requirement in their own vaults, and half could be kept at a central reserve city bank, but the central reserve city bank had to keep its entire reserve requirement in its own vaults. The central reserve city bank could count the deposit of the reserve city banks as part of their reserves; likewise, the reserve city banks could count the 9% of their deposits from country banks as part of their own reserve requirements. However, this stacking of reserves could, and did, create trouble if a country bank needed to withdraw its funds for its business. By drawing the money out of its reserve city bank account, that bank may, in turn, be forced to withdraw money from its central city bank account, which, in turn, may force the central city bank to call in their loans to the money market and to stock brokers. Hence, a contraction of a country bank's money supply could cause the money supply to contract in a distant city with its resulting depressive effect on the economy. A major shortcoming of the National Banking System was that there was no way to directly control the money supply. The demand of money would fluctuate along with the economy, but the supply was relatively fixed. So when demand increased, interest rates—the cost of money—increased with it. This happened frequently during times of harvest since farmers needed more money to harvest their crop. As interest rates rose, the economy contracted. The country experienced a severe depression in 1907, not only because of a shortage of the money supply, but also because of the frequent failures of state banks. State banks, because they were less regulated, had become far more numerous, so their frequent failures had severe economic repercussions. A National Monetary Commission was set up to find a better way to manage banks and the economy. Their solution was the Federal Reserve. The Federal Reserve Act of 1913 was enacted to create the Federal Reserve system, consisting of a new central bank – the Federal Reserve — and other national banks, to provide stable money and credit conditions, deemed necessary for a stable economy. National banks were required to be members of the Federal Reserve system. State banks could also be members, but they were required to buy stock in the Federal Reserve System. The new Federal Reserve Bank had the authority to stipulate minimum reserve requirements that member banks must hold for each dollar of deposits and to regulate the type of assets that banks could own. The Fed, as it came to be known, could also lend money to member banks to provide liquidity when needed, especially if there was a run on a bank.